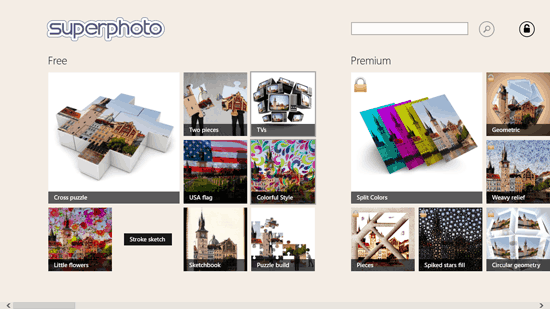 Published by Moonlighting, Superphoto Free is a free photo editing app that can be accessed on Windows 8 and 8.1 PC. The photo editing app has features that are unclocked for the free version, but there are also some features that are locked in this version and can be accessed from the paid version of Superphoto. The free version includes photo editing features like Cross puzzle, Two pieces, TVs, USA flag, Colorful style, Little flowers, Stroke sketch, Sketchbook and Puzzle build. The effects in the app will help you in creating different things with your photographs and images. With Cross puzzle you can create and print your photo in cross puzzle. 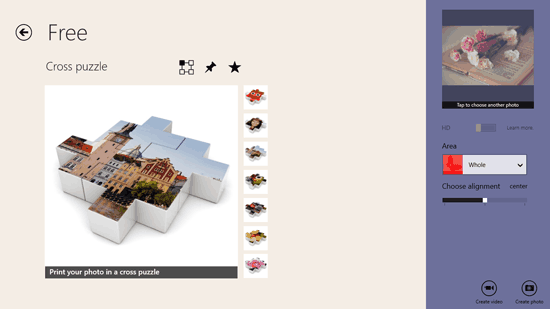 Two pieces will divide your picture in a puzzle which has only two pieces. TVs will generate your photograph in the TVs that are displayed on the screen. USA flag will overlay the flag of USA on the photograph you have uploaded to the app. Colorful style will splash colors on the photograph you have uploaded. In Little flowers, tiny flowers will be overlayed on the photograph you have uploaded. Stroke sketch will transform your photograph into a sketch. Sketchbook will make a drawing out of the photograph and Puzzle build will create a puzzle out of your photograph. There are filters like painting, color reflections, pencil BW, emboss, etc. ; cutouts wax stamp, banksy, sketch pamphlet, etc. ; 3D like cube, array, tiled border, warhol, etc. ; combos like colored metal, bw paint, squared pencil, colorful silhouette, etc. ; frames, bokeh, textures, patterns and brushes that can be applied to the photograph. 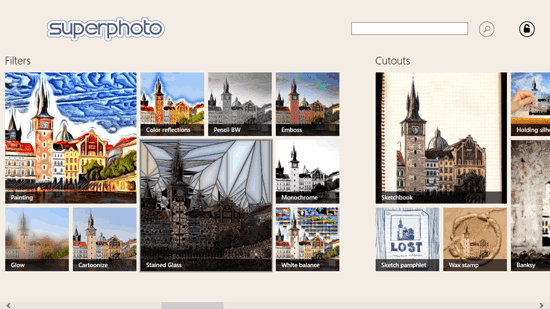 You can also try out 4 free photo editing apps for Windows 8. After creating the desired output from the given overlay and effects, you can click on create photo to make a photo or click on create video to create a video of the photograph with the audio from the list of audio files in the app. You can save the photo and the video to your desktop using the save button at the bottom of the screen.